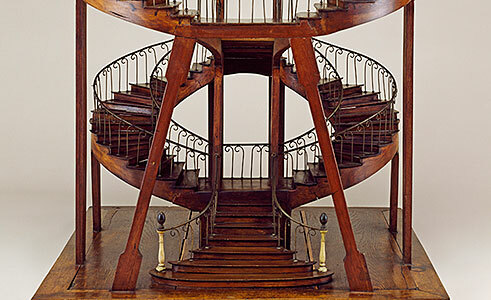 Models & Prototypes showcases the exceptional models of staircases donated to Cooper Hewitt by Eugene V. and Clare E. Thaw. Ranging in height from 6 inches to 4 feet, and dating from the late 18th to the early 20th century, the 16 models (and four accompanying drawings) display the structure and design for staircases in pulpits, bell towers, church domes, department stores and private homes. They also serve to document the European tradition of design instruction, with examples of models made by aspiring and established master craftsmen.